medieval village with all the trimmings. 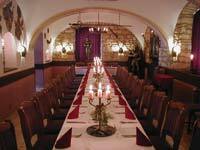 is a wonderful contemporary medieval restaurant where you feel that you have returned a few centuries back. will allow you to see beautiful views of the Czech Republic from above and you will even get 10% discount from us! is one of the symbols of our country. It was founded in 1348 by Charles IV as a treasury for coronation jewels. Do not miss a tour of the chapel of St. Cross. Is it necessary to book early! are the most beautiful caves in the country. They are open on Mondays, and enter may even disabled visitors. is known far beyond the borders of our country. You can see several new prospects and walk through a nature trail around America. when you get tired of sights, enjoy the new aqua park. with 18 high barriers, swing, low hurdles, with three artificial walls 10m height, prospect and little of adrenaline. try horseback riding on very suitable horses – huculs- great for beginners and small children. according to experts’ best bowling in the country. Try yourself and judge. you have surely cinema home, but if you want to go to the movies on vocation in Prague.